I rarely sign up for memberships or join special interest groups. However, last week I was feeling pretty lucky that I’m a Kinokuniya Bookstore member. You know why? 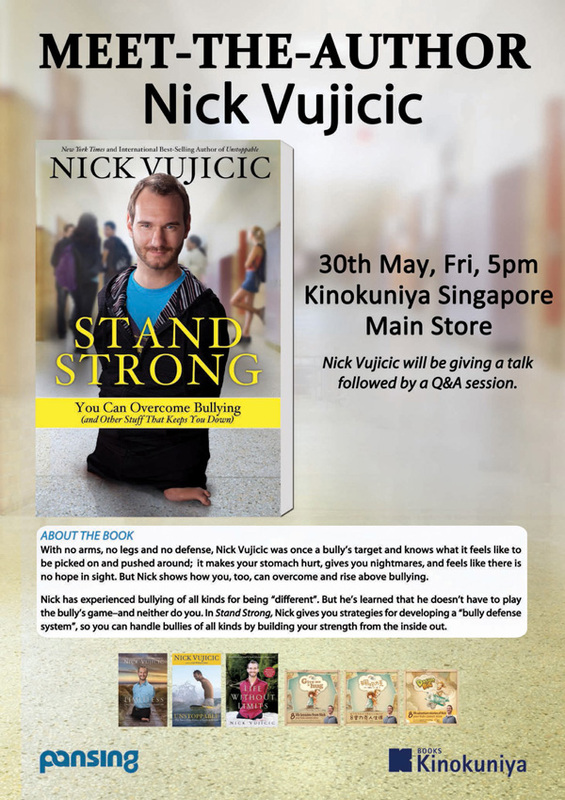 Because I received an invitation by email to meet author Nick Vujicic. If not for my membership, I would not have been alerted about this once-in-a- lifetime opportunity to meet an Incredibly Inspiring Individual (I.I.I.) right in my backyard. I had already seen photos of Nick but didn’t really know much about him. But when I finally met him in person, I was so moved by his warmth and will power (& charisma too!) that I had a strong urge to delve into his world and help spread the word about his amazing story. This week I share with you 5 inspiring messages that I heard from Nick Vujicic, best-selling author and well-loved human being. 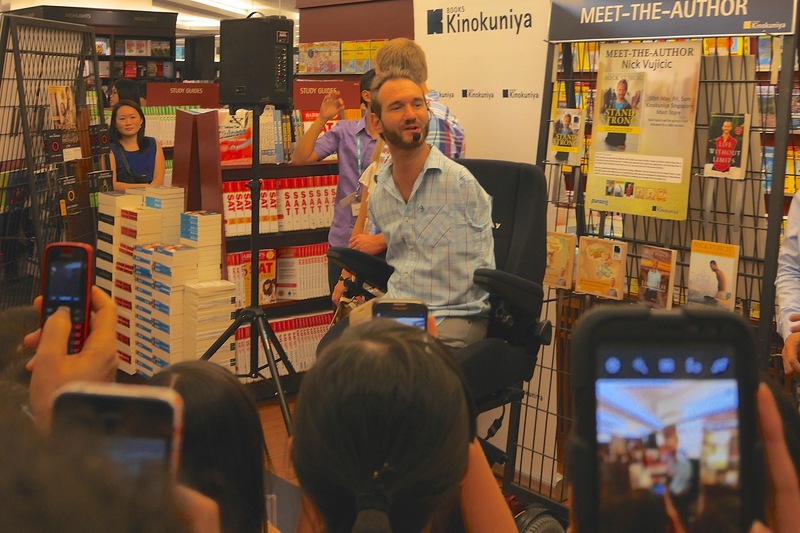 “Meet Nicholas Vujicic (pronounced VOO-yee-cheech). 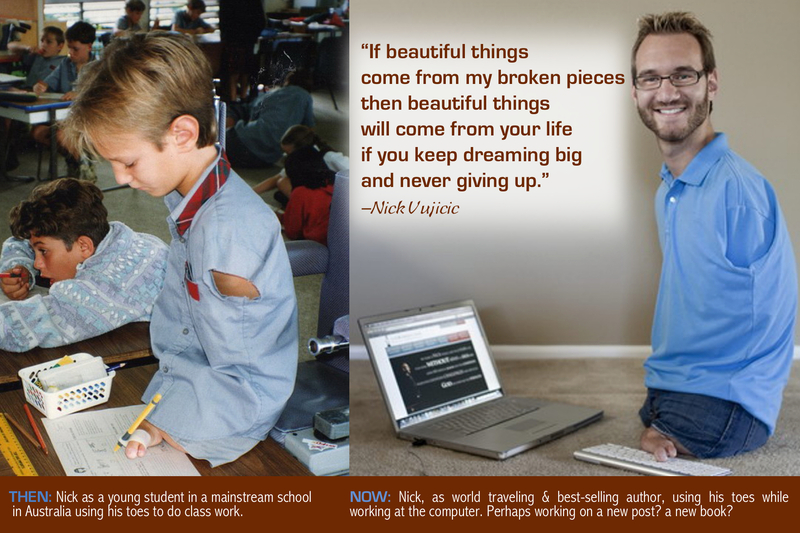 Without any medical explanation or warning, Nick was born in 1982 in Melbourne, Australia, without arms and legs. Three sonograms failed to reveal complications. And yet, the Vujicic family was destined to cope with both the challenge and blessing of raising a son who refused to allow his physical condition to limit his lifestyle. * Here is my first ‘salute collage’ ; I don’t want to call it a tribute since he’s very much alive – and living his life to the fullest, if I may add. I salute you Nick! You are a great inspiration! So do… as Nick does…make beautiful things come out of your life! 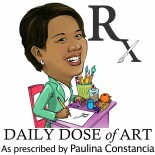 This entry was posted on June 5, 2014 by Paulina Constancia in Uncategorized and tagged inspiring individual.